Our city’s unusual name “Cotati” (pronounced ko-ta-tee) derives from the Kota’ti, a peaceful tribe-let of Coast Miwok Indians who populated this valley for generations. They thrived on the bounty of acorns, wild game, fish, grains, and berries that abounded in the temperate climate. The first Anglo settler, John Reed, arrived in 1827, but undoubtedly was discouraged in his farming by the native practice of annual field burning. Other non-natives followed, however, in very short order—bringing the usual, inimical trio of livestock and other invasive species, alien farming practices, and deadly germs. The native Kota’ti soon “disappeared.” A Mexican land grant, “Lomas de Kotate,” was established in 1844 encompassing 18,000 acres. This property passed through a number of hands, including those of Thomas O. Larkin, the first and only U.S. Consul to California. He arranged for its purchase in 1849 by Dr. Thomas Stokes Page, a friend and expatriate American physician then practicing in Valparaiso, Chile. 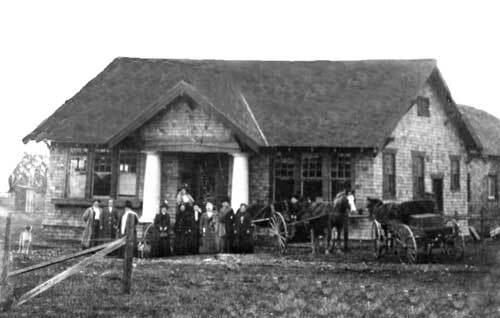 After numerous years of legal wrangling over Spanish, Mexican, Californian, and United States land law, Page’s agents established livestock and built a large Victorian home for the large Page family. Dr. Page’s wife, Anna Maria Liljevalch Page, and their minor and young adult children emigrated from Chile in 1869. Dr. Page died in 1872, leaving his émigré sons to run the sprawling dairy and stock farm. Described in an 1875 newspaper article as the largest farm in Sonoma County and one of the finest pieces of agricultural land in California, the property became known as “Rancho Cotate.” Because of a clause in Dr. Page’s will that the ranch should remain intact until his youngest child reached 25 years of age, the Rancho was the last of the great Sonoma County land grants to be subdivided (1892). Consequently most of the other towns and cities in Sonoma County are older than Cotati. In the late 1880s, with young William nearing 25, older brother Wilfred, manager of the rancho, changed the name to “Cotati” with an “i” (as the previous spelling led strangers to call it Co-tate) and subdivided a large portion of the ranch into farm, villa, and town lots surrounding a hexagonal plaza. The unusual shape of the town—probably unique in the United States even today—mirrored the Page’s huge six-sided barn, its watering trough, and a portion of the main Page mansion. The significance of the shape to the Pages remains a mystery. At any rate, Wilfred had six brothers and he named the streets surrounding La Plaza after them: Henry, Charles, Arthur, George, and William, and Olof (often misspelled “Olaf”). Apparently he did not deem his Page sisters, Anita, Lizzie, and Manuela worthy of street names; they still await the honor. For himself, Wilfred named what he expected to be a major thoroughfare: Wilfred Avenue. It now lies within Rohnert Park’s city limits and doesn’t go anywhere particular. 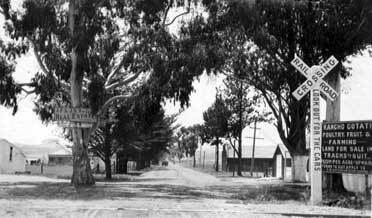 Other Cotati street names refer to Page family connections: Page Street; Valparaiso Avenue, named after the family’s previous home; Delano Street, named after Mrs. Page’s maternal family line; and El Rancho Drive, where the Page mansion stood until it burned in the 1930s. Turn-of-the-century visitors’ first view of Cotati was from the railroad depot on East Cotati Avenue. The newly formed Cotati Land Company, owned by the Page brothers, began selling lots in 1893. Railroad travelers arriving at or passing through Page’s Station on East Cotati Avenue could not miss the large signs offering ranch land at low prices and easy terms. Real estate salesman David Batchelor worked with the Pages to help new landowners establish chicken ranches, ranging from five to 20 acres, and other rural businesses. In all, some 9,000 acres accrued to the small landholders, while the Cotati Land Company retained about 4,000 acres as a still substantial ranch. In the 1930s, much of that vast ranch acreage became the Waldo Rohnert Seed Co., and eventually the city of Rohnert Park, incorporated in 1962. 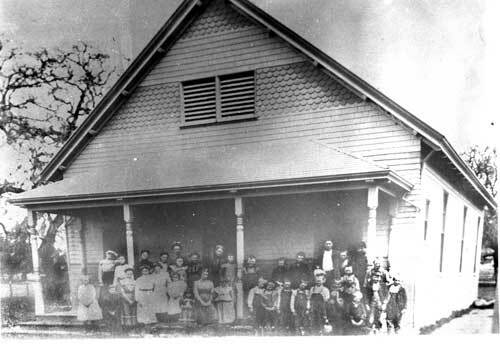 The first Cotati School, one room only, was built by the Pages in 1893. 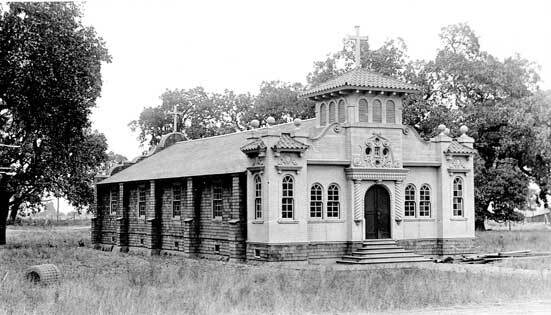 The Cotati Women’s Clubhouse, built in 1909, is now Congregation Ner Shalom. The founders established a post office and school in 1893 and the new Cotati folk got right down to forming a community. By the early 1900s they had built a Congregational Church (now Church of the Oaks), a Catholic Church (“old St. Joseph’s,” now the Korean Baptist Church), and a social hall for the Cotati Women’s Club (now Congregation Ner Shalom). The Odd Fellows Hall (now the home of Risk Management Services) and numerous stores sprang up around the Plaza to serve the surrounding agricultural area. 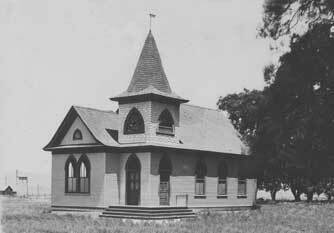 Cotati Congregational Church, now Church of the Oaks, built in 1907. In 1915, the Plaza became a regional landmark when the state of California opted to run the Petaluma-Santa Rosa Highway through the middle of Cotati. Local merchants enjoyed the automobile traffic coming through town and generating previously unimagined business. Garages, auto dealers, and restaurants rose up between the farm supply and general stores that had previously constituted Cotati’s business district. In the 1920s, Cotati formed a Volunteer Fire Department, an American Legion Post, and a renowned baseball team, sponsored by the town pool hall owner. Speculators developed an immense wooden auto racetrack near the railroad tracks on East Cotati Avenue, and drivers and fans converged from far and wide. This was, however, prior to the completion of the Golden Gate Bridge (1937) and the trip required a series of ferry and railroad connections. Not enough fans could manage the trip and the track was soon a financial failure. The lumber salvaged from its demolition produced several of the buildings still in use in downtown Cotati. Cotati’s population of self-sufficient small farmers and business-people weathered the Great Depression well enough. But after World War II the chicken business began to change from small family farms scattered along the north coast to large agribusinesses in California’s central valleys. Many small landholders left off farming and sold their lands for new home construction and modern businesses. Cotati, still unincorporated, established a Public Utility District in the early 1950s to provide sewer and water service; the county sheriff addressed public safety concerns; and the Chamber of Commerce served as the community’s prime force in making improvements. The Chamber’s Plaza-improvement projects included a number of memorials and monuments to local individuals and causes. But not the many statues for which contemporary Cotati is becoming known; they arose after Cotati became a city. That momentous event occurred in 1963 when the independent little community felt threatened by burgeoning Rohnert Park, a fully planned bedroom community incorporated in 1962. To retain its identity and rural lifestyle, Cotati finally incorporated. As a proper municipality it began to take more responsibility for its own destiny—experimenting with a number of civic forms before settling on the current city manager/city council arrangement. In the 1970s, students from the nearby and newly founded Sonoma State University took a special liking to traditional Cotati with its rustic lifestyle and initiated bold changes in the city’s philosophy and scenery. Along with local hippies, they converted the old Cotati Inn restaurant into The Inn of the Beginning and featured world-class rock, blues, and other artists. The Plaza Park became a social center with a volunteer-built bandstand and almost continuous popular use—to the joy of the younger citizens and dismay of the oldsters. 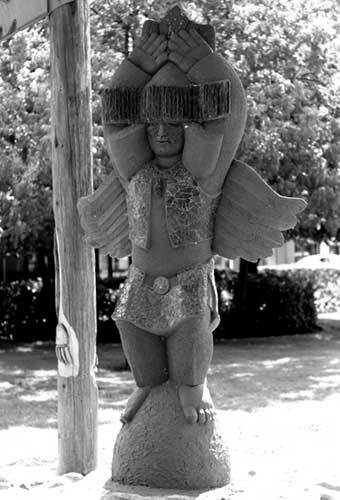 Artist and performer Vito Paulekas created the Plaza’s first statue, a fanciful, cement-composite-and-glass depiction of “Chief Kotate,” arms upraised in native ceremonial dance. In 1991, the first Cotati Accordion Festival resounded in the Plaza. Founded by local musicians, the festival became a hit with musicians, polka dancers, and other lovers of “Lady of Spain” from around Northern California. Bandleader and accordionist Jim Boggio was one of its stars. In 1997, after Boggio’s unexpected death, a cast bronze statue by Jim Kelly of the musician and containing an actual accordion was added to the Plaza scene. There are now multiple art and memorial installations and gardens scattered throughout this iconic public space. Still more public sculpture and performance art is being created for 2010 and beyond by an active committee of local citizens, musicians, and artists. Today, Cotati is a fully-fledged city with an efficient form of government, independent police and public works departments, planning and building departments and several active citizen commissions. The downtown’s general stores of the past have given way to sidewalk cafes and cabarets, and former farmland on the west side of town is home to industrial and business parks. But Cotati denizens remain as independent and forward-thinking as those early small-farm owners and business people who created the charming and quirky, artistic and musical, country-town energy that Cotati continues to pour forth. 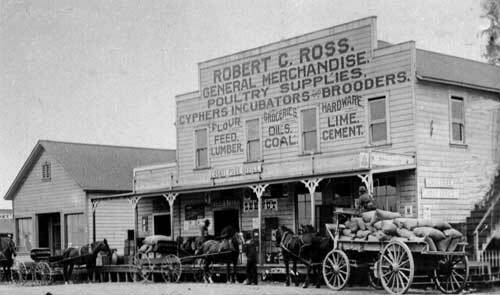 Robert Ross’s store on La Plaza was Cotati’s first major mercantile business. Vito Paulekas’s Chief Kotati statue in La Plaza Park honors the community’s indigenous founders and its contemporary musical and artistic spirit.